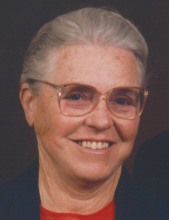 Alberta Eaker Wortman, 94 of Casar Road, passed away, Thursday, February 7, 2019 at Testa Family Hospice House surrounded by her family that loved her and those she loved dearly. A native of Cleveland County, she was the daughter of the late William George Eaker and Vernie Hoyle Eaker. After graduating high school, she and her husband ran Wortman's Grocery and retired after 47 years. She was a lifelong member of Corinth Baptist Church. Mrs. Wortman was a loving wife, mother, grandmother and great grandmother spending countless hours with her grandchildren. She was affectionately known as Granny to them. She loved her church family and community and was always caring and assisting those in need. She was preceded in death by her husband, Joe Self Wortman; a son, Dempsey Wortman; two brothers and a sister. Survivors include two sons, Dennis Wortman and wife, Rita of Casar and Devon Wortman of Mineral Springs; daughter-in-law, Lenore Wortman of Casar; grandchildren, Rebecca W. and Donald Peeler, Rachel W. James, Jennifer W. and Jimmy Summerlin, Judson and Amanda Wortman, W. Joe Wortman, John Wortman, Chelsey W. and David Felts, Todd Wortman and Darby Wortman; great-grandchildren, Andrew and Greyson Peeler, Madison and Dalton James, Daniel Felts, Hannah, Elijah and SiLi Summerlin, Baxter, Emma Grace and Elena Jo Wortman and two sisters, Pauline Downs of Casar and Billie Catherine Newton of Atlanta, Georgia. The family would like to express deepest gratitude to Dr. Calvin Caunt and nurse Kim, Hospice of Cleveland County and to Shelby Manor for their love and kindness. She made many endearing friends while living there over the last three years. A funeral service will be at 3:00 PM, Sunday at Corinth Baptist Church with Rev. Robert Goins and Rev. Norris Willis officiating. Memorials may be made to Corinth Baptist Church, 323 Corinth Church Road, Casar, NC 28020 or to Hospice Cleveland County, 951 Wendover Heights Drive, Shelby, NC 28150. To send flowers or a remembrance gift to the family of Alberta Eaker Wortman, please visit our Tribute Store. "Email Address" would like to share the life celebration of Alberta Eaker Wortman. Click on the "link" to go to share a favorite memory or leave a condolence message for the family.